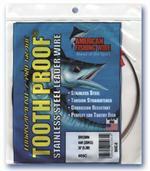 Provides superior protection against shark and other big game toothy fish. 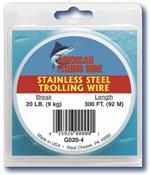 AFW - Stainless Steel Trolling Wire is soft, single strand wire carefully annealed for maximum flexibility and strength. The line sinks rapidly allowing the angler to get down deep using shorter lengths of line. 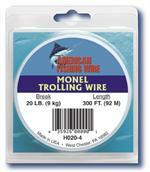 Knot it to your bait and line like monofilament, but with greater flexibility and less stretch. 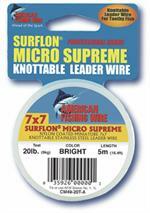 Smaller in diameter per pound test, Surflon Micro Supreme is less visible in the water. 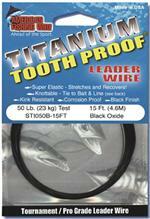 Raise angling success to a higher level with new Titanium Tooth Proof Leader Wire! No more haywire twisting - the technologically advanced titanium alloy delivers a high degree of flexibility. Made from specially controlled Type 304 stainless steel alloy, Tooth Proof is hard but not brittle, delivering both flexibility and strength. 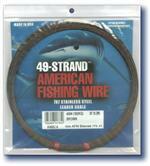 Specially stranded 1x7 Stainless Steel wire that provides the flexibility and resistance to bending fatigue required for use on downriggers.